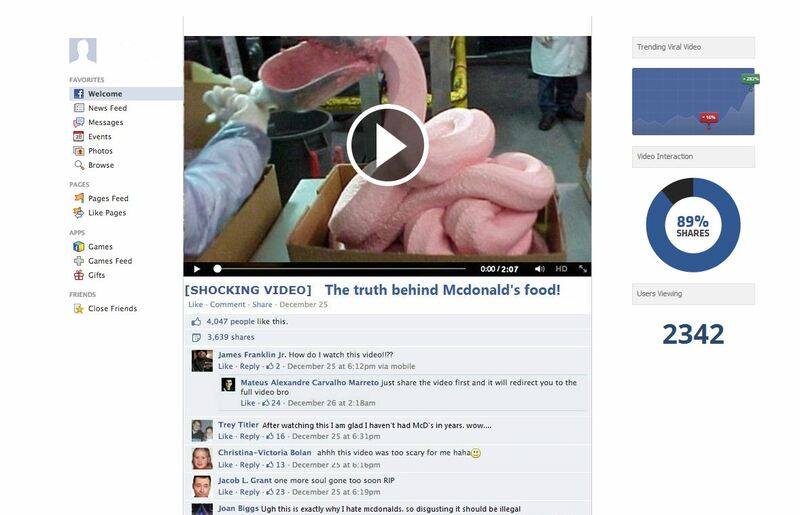 Be aware of the ‘[SHOCKING VIDEO] Find out the disturbing truth about McDonalds Food’ Facebook video which has gone viral. The viral ‘[SHOCKING VIDEO] Find out the disturbing truth about McDonalds Food’ video is a malicious video which will lure the victims to a malicious website. This malicious website is loaded with malware. The ‘[SHOCKING VIDEO] Find out the disturbing truth about McDonalds Food’ hoax has been crafted by scammers, as the hoax will generate a online revenue for the scammers. The scammers behind the ‘[SHOCKING VIDEO] Find out the disturbing truth about McDonalds Food’ video, demand the users to share the video on their Facebook timeline. You can see a perfect example, in the ‘SHOCKING VIDEO] Find out the disturbing truth about McDonalds Food’ Facebook share picture below.Once the user has shared the malicious [SHOCKING VIDEO] Find out the disturbing truth about McDonalds Food Facebook link, they will be redirected the a survey website. This survey website will generate money for the scammers.